We had all Ball canning goods on sale this past week. Now it's time to talk about canning the summer bounty. Today, let’s talk about Canning. 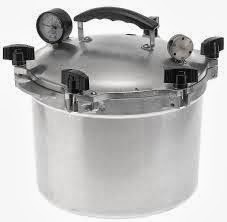 There are two basic types of canning, Pressure canning and hot water bath. My mom canned when I was growing up so it was something I was used to watching. Mostly she canned with a hot water bath. 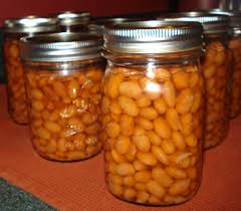 You do not have to garden to save money by canning! I bought an entire case of peaches last year at County Market and put up 36 pints of Peach jams. I asked the produce guy while they were in season if he’d give me a deal, and guess what? He did. You do not need to buy 3 apples at a time to make apple butter, ask about deals in the store. Hot water bath canning is used for softer vegetables. Tomato is the most common. You use a large canning pot. Most are stainless steel or the older ones are enamelware blue. They hold 9-12 quart jars and a LOT of water. This is easy! You’ll need a canning book to know how long to keep each jar in the hot water bath so that it will be well preserved. I’d suggest looking for some on ebay. You can pick up canning books from the 50’s cheap and they give all kinds of recipes that will save your family money. Like: Pasta sauce, stewed tomatoes, homemade rotel, etc. Next, there is pressure canning. My mom used to be afraid to use her pressure canner. You want a safe canner. The older models would have issues with them getting too much pressure and blowing all over the kitchen. Which of course is dangerous. The issues were around the jigger and gaskets. With newer models, they have managed to eliminate most of the dangers. You need pressure for dry beans or meats. Want to save money? Can your soup beans from dry beans at the store. Want to save time? Potatoes! Ready to heat and mash in less than 10 seconds. I have two pressure canners. One really big one so I can do large batches of ham or chicken. Yes, I can meat! Why? To save time. When chicken breast goes on sale I cut it up and pop it into jars. I can pressure can 20 lbs. and have it ready for meals whenever I pull it off the shelf. NO PRESERVATIVES. I have to say, both the ham and chicken are the best I’ve eaten. The first time I did it I was hesitant to open that first jar and try it but it was SOOOO good. It cooks in it’s own juices. Great for pasta, tacos, and soups. I bought an old one for $10, and replaced the gaskets. Be sure it has a lift basket! My second pressure canner is small. It’s for 6 to 8 jelly jars. It’s tiny compared to my big one. I can whip up some peppers and put them up with just a small batch. It seem the peppers never all ripen at once. I bought it at a garage sale for $4. You will need good supplies for canning. You’ll want Quart jars, pints, and I love the little jelly jars. I practically collect them. I buy a case of new jars each year WITH A COUPON. Ball has many coupons. I also get jars from garage sales, freecycle, and word of mouth. If you tell people you need jars, they will unload them on you! Be sure to tell them you do not want mayonnaise jars. Just the jars that will take the pressure and high temps. Think about how you will use the goods. Don’t can a quart of jam, if it will take you a month to consume the product. Don’t can a pint of apple pie filling, when you need 2 quarts for a pie. You also need caps. I have both one time use caps, and the forever caps. I am working my way up to having only the reusable ones. Both work great. Ball makes a good starter kit of tools. I never can the basics. No green beans in my cupboard, but I do can Cardamon Peach jam that is to die for, and blueberry sauce for ice cream. I highly recommend the old books for good value recipes. My advice on picking up books: Once you have a few jam recipes, you have em all. Look for books containing more rare things to can like Jalapeños, potatoes, salsas and condiments etc. Ebay Canning books- The old Kerr or Ball ones are good, look a thrift and second hand stores, often old books are donated. Mother Earth News- Many gardeners use this site, and the canning section is often updated. Jackie's Blog and article about canning meats-Meat doesn't look good canned, but tastes fantastic. Very juicy. Modern Canning: Amazon has some of the best modern books for condiments. I have Put Em Up, its a good one.